TDKR Is Super Pro-Fascist Propaganda The Best Actors Who Have Played Batman Villains Fun Facts About TDK Trilogy Things to Know About Burton's Films Best Characters in Nolan's Trilogy Gaping Holes in The Dark Knight Every Batman Movie, Ranked Batman Begins Is Better Than TDK Who Should Be the Next Batman? Behind the Scenes of Burton's Batman Why Batman Is So Hard to Cast In Praise of Tim Burton's Version Easter Eggs in the Lego Version But Have You Played the Arkham Trilogy? 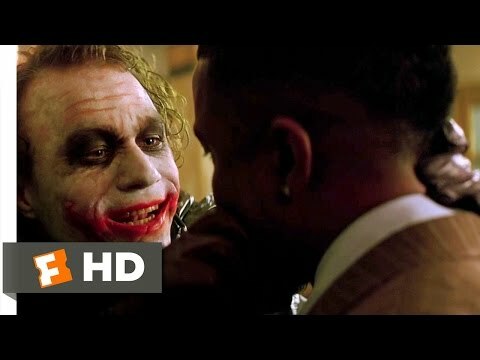 'The Dark Knight' movie quotes represent the best lines from this 2008 Christopher Nolan film -- the second in his 'Batman' trilogy. 'The Dark Knight' is widely considered one of the best Batman films ever made. In 'The Dark Knight,' Christian Bale returns as Bruce Wayne/Batman. This time, he's got to save Gotham City from one of the most sinister villains ever: the Joker (Heath Ledger). This list is for fans, so be sure to vote for your favorite 'TDK' quotes and vote down any lines you just don't like. Also, feel free to add any 'Dark Knight' film quotes that are missing. Batman trilogy fans, check out these lists for the best quotes from 'Batman Begins' and 'The Dark Knight Rises,' along with this list of all the 'Batman' movies (ranked from best to worst). 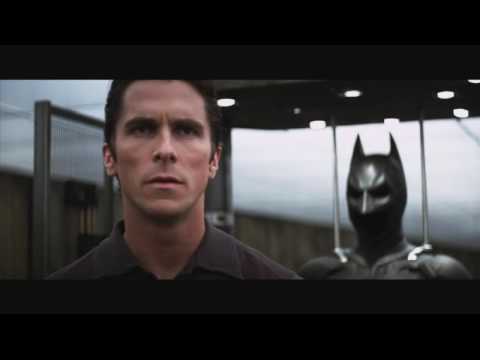 There's no doubt that Chris Nolan's trilogy has given us some of the greatest Batman quotes ever! 'The Dark Knight' was a smashing success at the box office, taking in more than $533 million domestically. The film garnered multiple Oscar nominations, and actor Heath Ledger won a posthumous Academy Award for his performance as the Joker. In 'The Dark Knight,' Batman battles the most frightening and deadly enemy he's ever encountered, his arch nemesis, the Joker. He needs help from Jim Gordon (Gary Oldman) and District Attorney Harvey Dent (Aaron Eckhart) to do it, and even then -- it might not be enough. Other returning characters in 'The Dark Knight' include Michael Caine as Alfred Pennyworth and Morgan Freeman as Lucius Fox. 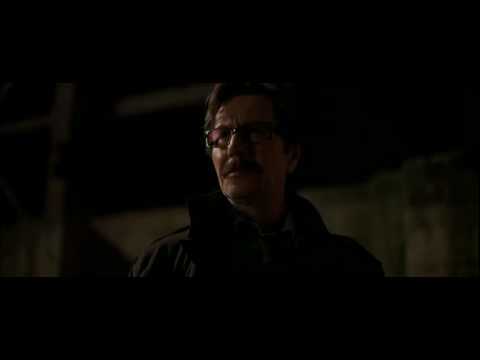 James Gordon, Jr.: "Why's he running, Dad?" Jim Gordon: "Because we have to chase him." James Gordon, Jr.: "He didn't do anything wrong." Jim Gordon: "Because he's the hero Gotham deserves, but not the one it needs right now. So we'll hunt him. Because he can take it. Because he's not our hero. He's a silent guardian, a watchful protector. A dark knight." Alfred Pennyworth: "With respect Master Wayne, perhaps this is a man that you don't fully understand, either. A long time ago, I was in Burma. My friends and I were working for the local government. They were trying to buy the loyalty of tribal leaders by bribing them with precious stones. But their caravans were being raided in a forest north of Rangoon by a bandit. So, we went looking for the stones. But in six months, we never met anybody who traded with him. One day, I saw a child playing with a ruby the size of a tangerine. The bandit had been throwing them away." Bruce Wayne: "So why steal them?" Alfred Pennyworth: "Well, because he thought it was good sport. Because some men aren't looking for anything logical, like money. They can't be bought, bullied, reasoned, or negotiated with. Some men just want to watch the world burn." The Joker: "You wanna know how I got these scars? My father, was a drinker, and a fiend. And one night, he goes off crazier than usual. Mommy gets the kitchen knife to defend herself. He doesn't like that. Not. One. Bit. So, me watching, he takes the knife to her, laughing while he does it. He turns to me and he says, "Why so serious?" He comes at me with the knife. "WHY SO SERIOUS?" 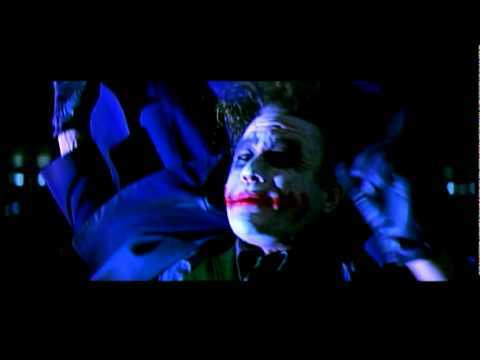 He sticks the blade in my mouth..."Let's put a smile on that face." And...Why so serious?" Here, we learn how the Joker got his hideous scars, and we learn, at least in part, why he's completely crazy. As a child, he suffered terribly. Now, as an adult, he's hell-bent on making others suffer just as much -- or more. The Joker: "Oh, you. You just couldn't let me go, could you? This is what happens when an unstoppable force meets an immovable object. You are truly are incorruptible, aren't you? Huh? You won't kill me out of some misplaced sense of self-righteousness. And I won't kill you because you're just too much fun. I think you and I are destined to do this forever." Batman: "You'll be in a padded cell forever." The Joker: "Maybe we can share one. You know, they'll be doubling up, the rate this city's inhabitants are losing their minds..."
Batman: "This city just showed you that it's full of people ready to believe in good." The Joker: "Until their spirit breaks completely. Until they get a good look at the real Harvey Dent and all the heroic things he's done. You didn't think I'd risk losing the battle for Gotham's soul in a fist fight with you? No. You need an ace in the hole. Mine's Harvey." Batman: "What did you do?" The Joker: "I took Gotham's white knight and I brought him down to our level. It wasn't hard. You see, madness, as you know, is like gravity. All it takes is a little push!" Health Ledger's Joker is without a doubt one of the absolute best villains ever on the big screen. Here, he toys with Batman again, explaining that he's gotten to District Attorney Harvey Dent (Aaron Eckhart). And, he adds, it didn't take much to push Dent right over the edge.